This lesson will give you an overview of how to search/filter lessons in Tags mode. The options we will show in this lesson apply when you are in Tags mode. You have a few options for filtering lessons. 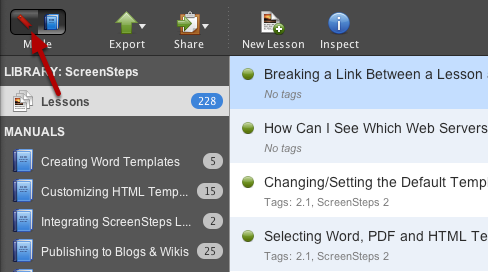 Unassigned to Tag will only display lessons that have not been tagged yet. You can also filter Draft lessons or lessons that have a specific status. You can sort lessons by Title or the last time they were modified. Search text will search lesson and step text for a match. Tip: You can search for tags using the search by means of the "tag:" string. Here are some examples. Prev: Why don't images show up in emails I send that I pasted a lesson into? Next: How Do I Tag a Lesson?